The Mega Flash DMX is a powerful DMX-compatible strobe light with a whopping 800 watts of output. It also works as a stand alone unit witout a DMX controller by using the speed and dimmer control knobs on the rear of the unit and includes a build in microphone so that it can be set to flash to the beat of the music. 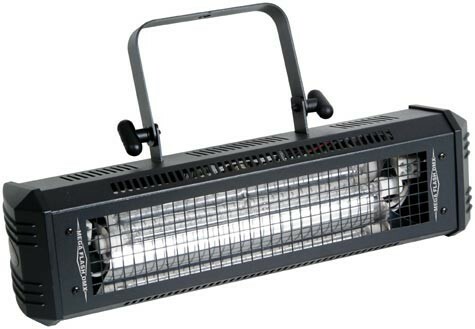 Compact and pocketbook-friendly, the brilliant Mega Flash DMX outstrobes similar fixtures in its price range by as much as a brightness factor of 4. With the power to transform any dance floor into a heavenly pulsar, the Mega Flash DMX is the product of cutting-edge lighting technology that allows for enormous amounts of added wattage without all the excess weight associated with older designs. Small and compact, the fixture weighs a mere 5 lbs. and comes with a durable, high-tech plastic case that protects it from damage during transport, setup, and breakdown. The Mega Flash DMX lets you change strobe speeds and adjust dimming from 0 100 percent via a standard DMX lighting controller. Speed- and dimming-control knobs are also located on the rear of the unit if you want to operate the Mega Flash DMX without a controller. The fixture also can be set to operate in sound-active mode to flash along to the beat of the music.